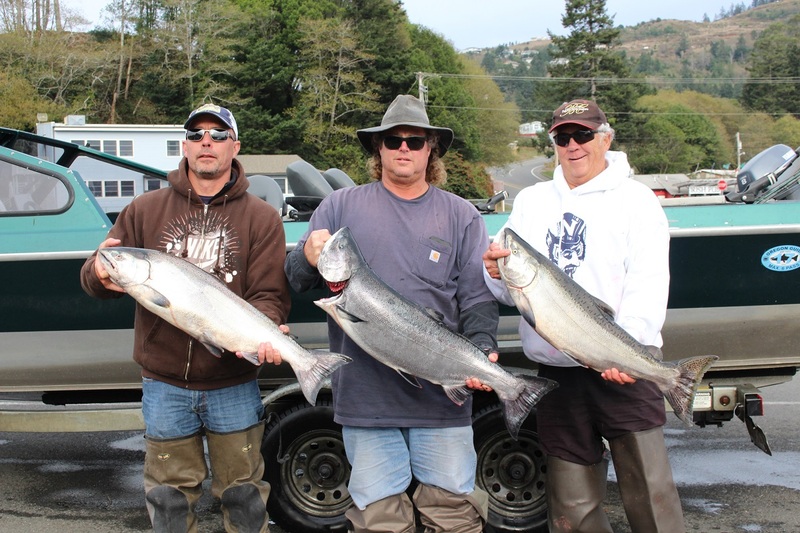 Craig Chisum, Scott Gunn and Tom Gunn, all from Reno, Nevada fished with guide Jack Hanson in the Chetco estuary last week pulling straight bait (anchovies) and were rewarded with fresh chrome-bright Chinook. November is the month when storms start pummeling the southern Oregon and northern California coastline. And to a river fisherman, storms mean only one thing - rain, beautiful droplets of salmon caffeine! And with rains come rising rivers; and with rising rivers follow the Chinook. It's the natural procession of nature. In this neck of the woods, the two main river systems that anglers are going to be keeping their eyes on are California's Smith River and Oregon's Chetco River. Each river shares its own favored flows and each river requires that you possess a fishing license belonging to the state in which the river flows through. Now I only mention both states' rivers in this article because they are so danged close to each other, that it is not out of the question to see a river guide fishing one waterbody in the morning and then pulling up stakes to fish the other in the same day. The Smith is subject to low-flow closures from October 1 through January 31. Certain reaches of the Smith River system requires a minimum of 600 cubic feet per second as read at the Jedediah Smith Gauge in order for its doors to open to angling. The most frequently fished stretch subject to low-flow closures is the mainstem Smith River from the mouth of Rowdy Creek to its confluence with the middle fork Smith River. The Smith River rises the fastest and drops the quickest of the two rivers. It also fishes well when the river is rising while the Chetco fishes the best while it is on-the-drop. Suffice it to say, with recent rains, the Smith has been enjoying flows well over 600 cfs. "The Smith was 4,500 cfs this morning," said guide Jack Hanson on Thursday. "It was looking pretty nice this morning. It's gone super brown on us twice already and now it's trying to settle in again. Now it's 8,000 cfs and it's really pumping." And the salmon limit is easy to remember. "It's one a day," notes Hanson. "One is the number. It doesn't matter if it's a wild or a hatchery fish or even a jack - the number is one!" Hanson also noted that the annual limit is 5 salmon a year. Call 707-822-3164 to keep apprised of Smith River closures and openings. 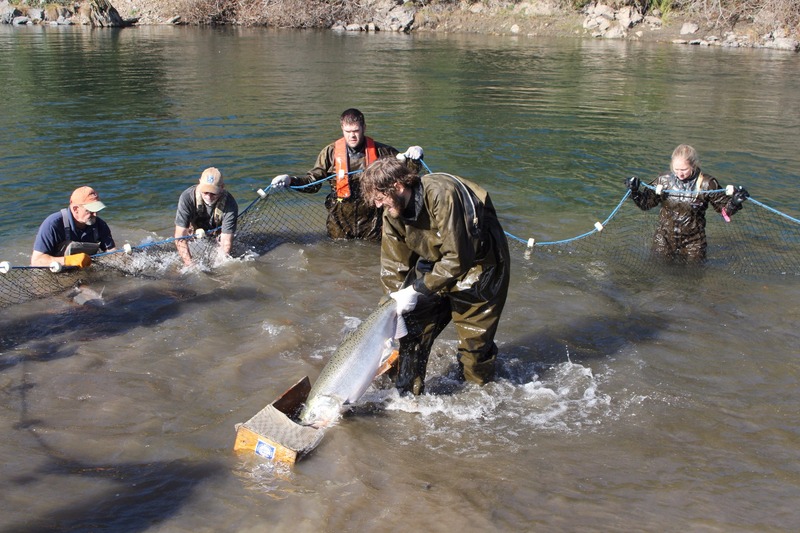 The Chetco River has also been kicking out its fair share of Kong-size kings. Before the river rose at the end of the week, Hanson was still fishing the estuary and puttin' the hurtin' on fresh chrome-bright Chinook while trolling a straight bait setup. I can safely say that the estuary action is over and done with now. Anglers really live for the Chetco to be in the neighborhood of 2,000 to 4,000 cfs, where more effective fishing techniques can be deployed. At 4,000 cfs, the Chetco blows out and is unfishable for drift boaters. But at 2 am on Friday, the Chetco was pushing upwards toward 5,100 cfs. The National Weather Service was predicting that Old Man Chetco was going to keep on rising toward 7,000 cfs. While the Chetco is on-the-rise, it will be spewing brown mud until it decides to lower and clear. As it drops, the suspended particulate matter will become less dense and the river should take on a pea-green or slate-gray complexion. If the NWS's predictions come to fruition, the river just might pull into perfect shape for plunkers as soon as Sunday morning - midweek at the latest. Due to recent years' November flows, it has been quite a spell since plunking has been an effective fishing method for salmon on the Chetco. But with a few breaks in forecasted storms, plunking just might be the technique that rules the river this month. At any rate, November is always a good month to look for fresh chromers entering the river. There should be plenty of action for anglers who have the knack for plunking from the bank or for boaters who are pulling plugs or back-bouncing roe when the river drops below 4,000 cfs. To keep updated on current Chetco and Smith river flows in real time, visit rivervilla.com, click on Recreational River Flows and click on the river of your dreams. Chinook jumping and splashing in lower Chetco tidewater last week prompted anglers to try a plethora of techniques ranging from drift-fishing to fly fishing.